New York (dpo) - Donald Trump is preparing to take on the most difficult job in the world. 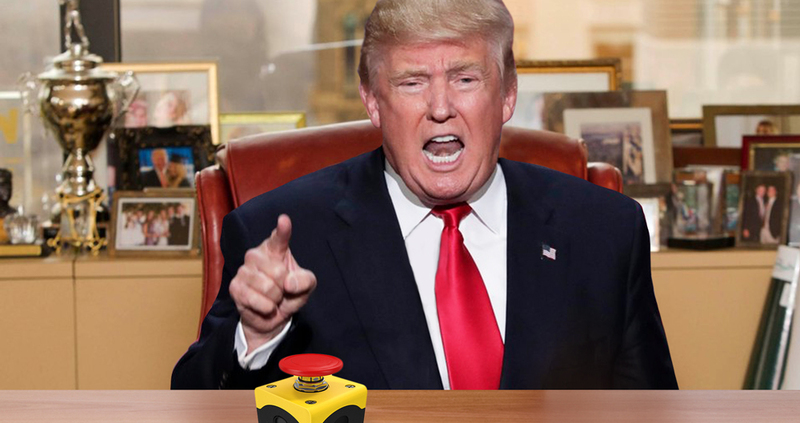 One day before being sworn in as 45th President of the United States, he is already extremely focused and practising hard on a model nuclear launch button installed on his desk in Trump Tower. The President-elect is warming up by repeatedly pressing the red button marked “THE BOMB!”. Sometimes he savours the moment and presses slowly, other times he gives it a quick tap and occasionally he smashes down on it like a lunatic. Practising on the model is not only a test of Trump’s speed, it also allows him to build sufficient muscle in his index finger to ensure it will function in an emergency. The President-elect then sends one of his aides to call President Obama while still in office in order to find out whether pressing once fires the entire arsenal and if not, whether there is an ‘automatic’ setting or if each of the over 600 US nuclear missiles has to be launched individually.